Here are the Southern Decadence questions that we get asked most often. When is Southern Decadence Weekend in 2019? Southern Decadence is always Labor Day Weekend. In 2019, the Southern Decadence dates are Thursday, August 29 through Monday, September 2. And if you like to really plan ahead, the dates for 2020 are September 3 through September 7. And here's a little Decadence trivia: the Southern Decadence dates for 2020 are the latest that they can ever be. What is the minimum age for admission to Southern Decadence events? All events at The Bourbon Pub / Parade are 21 to enter and to consume alcohol. Much of Southern Decadence (including Saturday's Bourbon Street Extravaganza and Sunday's walking parade) takes place in the streets of the French Quarter, and is open to the general public. SOME GREAT 2019 ADVANCE HOTEL RATES ARE AVAILABLE NOW AT OUR HOST HOTEL, THE BOURBON ORLEANS. Southern Decadence on FACEBOOK. Also, please join our email list: Southern Decadence Email List. Why should I purchase a Weekend Pass online in advance instead of waiting until later? There are good reasons to purchase a Weekend Pass online. Only a limited number of Weekend Passes are sold, and VIP Weekend Passes always sell out before the weekend even starts. If you purchase in advance, you will save a few bucks compared to the cost of nightly admissions. And credit cards may be used for online purchases ... On-premises purchases are cash-only. Click here: Southern Decadence Weekend Passes. And please consider joining our email list and following us on Facebook, and be among the first to receive updates about Southern Decadence 2019. What are the official colors and theme of Southern Decadence 2019? The official colors and theme for 2019 will be announced in early June of 2019. Are cameras permitted at Southern Decadence events? Of course, cameras are permitted on the streets of the French Quarter. Each venue establishes their own policies regarding the on-premises use of cameras, video recorders and cell phone cameras. Do many lesbians attend Southern Decadence? While predominantly a gay male event, a surprising number of lesbians have discovered the unique fun of Southern Decadence, and return year after year. Southern Decadence is for the entire gay, lesbian, bisexual and transgendered community, and is very well attended by all. And a surprisingly large number of open-minded straight fans enjoy the festivities, and always come back for more! Is it possible to purchase a copy of the music played during Southern Decadence? Yes, many of the DJs featured during Southern Decadence at the Bourbon Pub / Parade will have CDs available for purchase. How can I keep up with the latest news on Southern Decadence 2019? 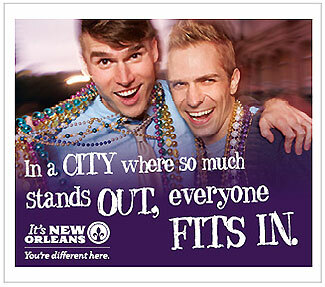 Join our special Southern Decadence e-mail list. Your e-mail address will be kept confidential and will not be shared with others. You may unsubscribe at any time. To join, simply click the "JOIN NOW" box below, or click HERE. Also, follow us on Facebook and Twitter. What is the parade route for the Sunday street parade? There will be only one official Southern Decadence street parade in 2019: the 45th annual walking parade which makes its way through the streets of the French Quarter on Sunday afternoon. Click here for parade information and a tentative map of the official route: Southern Decadence Parade Route. Is there an official Southern Decadence Facebook page? Is Southern Decadence on TWITTER?